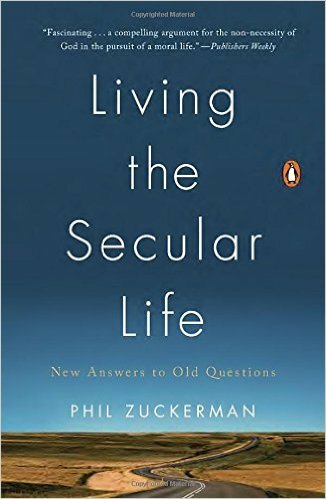 If you’re looking for a fairly simple read on what makes non-religious and/or atheistic people tick, Living the Secular Life by Phil Zuckerman is a good place to start. I picked this book up mainly because as a teacher and speaker at our church, I’m interested in knowing more about how the other side thinks. I went into this book believing that a secularist views himself as the standard by which goodness is determined, and that while he argues faith is not needed, he too has faith: faith in himself. The author didn’t let me down. He argued in circles, always arriving at the same place for the standard of living: self. Suggesting that secular (non-religious) people get along just fine, Zuckerman argues that the values secularists hold (most of which happen to also be Biblical values) stem from an innate sense of goodness and love for others. What the author leaves out is that currently on planet Earth, there are 7.1 billion people who hold different opinions on what is right, moral, and good. Who’s standard is the right one? Sensing this weakness, the author feels obligated to discuss the thought process by which secularists determine what is right, which happens to be the Golden Rule. However, Zuckerman is careful to point out (or attempt to) that the Golden Rule predates God’s Word. In fact, Zuckerman suggests that holding the truth-claims of a religion is a “cop-out” because a believer clings to dogma rather than making the really tough choices on right and wrong himself. Perhaps the most disturbing chapter of this book is “Raising Kids” in which the author describes ways to discuss death, obedience, and the afterlife with children in non-religious ways. Zuckerman states that the secularist legacy passed on to children is “the gift of allowing them to be unencumbered, unrestrained, and unfettered in choosing how they want to construct their lives and express their individual orientations” (p. 106). His ideal is essentially to raise children believing the world is without rules and anyone who attempts to make some is a villain. This book is worth a look simply for the sake of reaffirming why secularist philosophy cannot hold water. A belief system in which there is no absolute standard and no agreed-upon, core values is a system that is no help to anyone…even a secularist. As Zuckerman grudgingly admits, the bottom line about life, beliefs, and morality is that “It all boils down to choice” (p. 104). What if your choice is wrong? Zuckerman, P. (2014). Living the Secular Life: New Answers to Old Questions. Penguin.